In addition to a solid knowledge of the new grad’s field (noted by earning a good GPA and participation in internships), employers are looking for grads who have a number of “soft” skills, according to a new survey conducted by the National Association of Colleges and Employers (NACE). 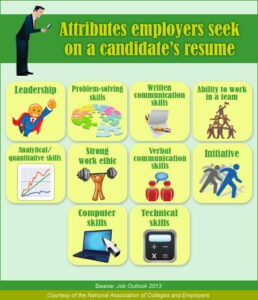 Employers taking part in NACE’s Job Outlook 2013 survey say they look for a range of soft skills, including leadership abilities, initiative, the ability to communicate, and more. How does a new college graduate demonstrate these attributes? Here’s where outside activities and interests are important. Joining and holding an office in a profession-related organization, participating in intramural sports, and volunteering are some of the activities employers look for as evidence of a student’s taking the opportunity to learn those skills.